Is there any hope left for humanity? Has the Humans TV show been cancelled or renewed for a fourth season on AMC? The television vulture is watching all the latest cancellation and renewal news, so this page is the place to track the status of Humans, season four. Bookmark it, or subscribe for the latest updates. Remember, the television vulture is watching your shows. Are you? 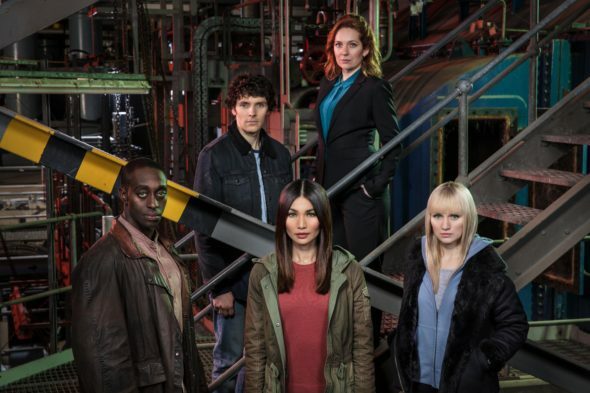 An AMC sci-fi drama, Humans stars Gemma Chan, Ivanno Jeremiah, Katherine Parkinson, Tom Goodman-Hill, Emily Berrington, Colin Morgan, and Ruth Bradley. Holly Earl, Ukweli Roach, Mark Bonnar, and Dino Fetscher join the Humans season three cast. The yarn unravels in a parallel present, where the latest must-have gadget for any home is a Synthetic. What happens though, when the “Synths” are imbued with consciousness and free will? The artificial intelligence series explores the possible consequences of blurring the lines between human and machine. The third season of Humans averaged a 0.08 rating in the 18-49 demographic and 353,000 viewers. Compared to season two, that’s down by 42% in the demo and down by 24% in viewership. Learn how Humans stacks up against other AMC TV shows. As of April 20, 2019, Humans has not been cancelled or renewed for a fourth season. Stay tuned for further updates. Will AMC cancel or renew Humans for season four? The ratings are way down (again) and AMC has moved it to 11:00 PM. It really seems like it will be cancelled — unless Channel 4 in the UK wants to keep it going. That would likely make it cheap enough for AMC to get on board. Clearly, the ratings aren’t incentive enough. I’ll keep a hungry eye out and update this page with breaking developments. Subscribe for free Humans cancellation or renewal alerts. TV show ratings are still important. Follow Humans‘s weekly ups and downs. Check the rankings for AMC’s other scripted TV shows. How do this show’s ratings compare to broadcast network TV shows? Find more Humans TV series news or other AMC TV show news. What do you think? Should AMC renew the Humans TV show for season four? How would you feel if AMC cancelled this TV series, instead? The Terror: Is the AMC TV Series Cancelled or Renewed for Season Two? Preacher: Is the AMC TV Series Cancelled or Renewed for Season Four? Fear the Walking Dead on AMC: Cancelled or Renewed for Season Five? Better Call Saul: Cancelled or Renewed for Season Five on AMC? Dietland: Is the AMC TV Series Cancelled or Renewed for Season Two? The Walking Dead on AMC: Cancelled or Renewed for Season Nine? Better Call Saul: Is the AMC TV Series Cancelled or Renewed for Season Four? Preacher: Cancelled or Renewed for Season Three on AMC? Fear the Walking Dead: Cancelled or Renewed for Season Four on AMC? Loaded: Cancelled or Renewed for Season Two on AMC? The Son: Is the AMC TV Series Cancelled or Renewed for Season Two? I own digital episodes of all three seasons of Humans. Definitely enjoy the show and am anxiously awaiting season four. Just seems too long to wait every year. I loved Seasons 1 & 2. Season 3 seemed much darker to me, although I still enjoyed most of the twists and turns. However, I thought it went completely off the rails in the finale, too far-fetched and unbelievable, even for sci-fi. The Synth Who Sleeps, the hidden messages and “deeper” meanings, and the big reveal at the end were over the top. And, without spoilers, I have to say the death in the final episode of such a pivotal character was unnecessary and probably killed the series. I really love humans, it’s available on amazon prime for americans i picked it up here. 🙂 it’s a fabulous show in the scifi scene, it hasn’t been this amazing since firefly in terms of cast, plot, pacing, ingenuity and execution. I am looking forwad to enjoy watching HUMANS soon…please do not cancel the show….thanks. Love Humans, I find it intelligent in the way of the movie Blade runner. So much of tv is wasted on empty minded drama or action with an immature story line. I hope this show is renewed! We love HUMANS! We’re hooked and in love with the characters. Compassion, acceptance, empathy…inclusion, and non-violence — these are needed and timely issues that HUMANS so brilliantly showcases. Please release Season 4 ASAP and serve the Greater Good. Please bring it back! I literally finished it last night on Prime Video and I want to see more, I love shows like this. If its not gonna return on AMC then Prime video should continue or some other channel or streaming app. Pleeeeeeeeeeese. It feels like there is a lot of story left to tell. This is one of my favorite shows. It pulled me back to AMC, which I haven’t watched in years. I feel the opposite. The story has been told. Humans reacted as expected and murdered innocents. The whole “hybrid” thing is a different story entirely, and I’m not really interested in seeing how it plays out. Humans is the best show on TV hands down. How on Earth does this show have low ratings. For those who have not watched this show, you are missing out!! Please make season 4 and beyond. It requires too much thought for the average person to commit to. That said, I feel the story has been completed. But the entire arc of the baby is completely open ended. I’ve been waiting 3 seasons for a glimpse at coexistence. That’s what season 4 would be for.